Most children dread the thought of waking up for school, but Saira Sattar is not like most children, nor is her school like most others. “Every morning I love to wake up to the thought that I am actually going to school,” says an excited Saira as she jots down the latest maths lesson from the blackboard. She is a student of class five at a free-of-cost home school run by the NGO Health-Oriented Preventive Education (HOPE). If not for this school, situated in Karachi’s Mujahid Colony, Saira would spend her days loitering on the streets like millions of other impoverished children in Pakistan. “I used to dream of going to school and becoming a teacher when I grew up, but I thought it would never happen. Now I feel it will all come true,” says Saira. Just a few years ago, even entertaining such a thought would have been impossible for Saira and those who, like her, are simply unable to afford even basic education. Now, things are different. 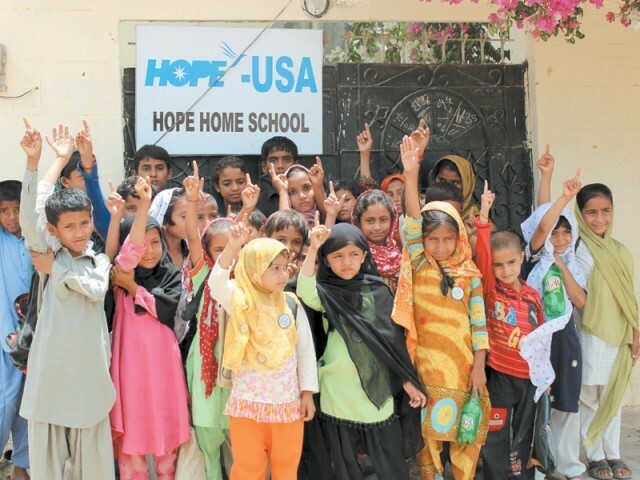 In 2006, HOPE set up an ‘informal’ schooling system for the destitute and now it runs 200 home schools from Azad Jammu and Kashmir and Khyber-Pakhtunkhwa in the north of Pakistan all the way south to Thatta and Karachi. It’s informal in that the classes are held not in purpose-built buildings but in the homes of the local communities. There’s a reason for that. “It’s undeniably impressive to have a large well-equipped school building, but it requires a lot of investment,” says Dr Mubina Agboatwalla, the chairperson of HOPE. “By saving on the cost of the school we can actually spend more on widening the reach of education. In Rs35,000 per annum we can teach 35 children, so in just Rs1,000, a child can be educated for a whole year and get a chance to turn his life around. It also takes away the hesitancy of a donor who, in a meagre amount, can see the result right in front of his eyes,” she says. By saving on infrastructure, HOPE also manages to focus more on the quality of the teachers, who are handpicked and appointed after a thorough assessment and trial. Every year the teachers are also sent for training so that they can further hone their skills. The goal, says Agboatwalla, is to initiate a new system of learning that understands the reasons that so many children do not attend school. Eight-year-old Muzammil Hussain would be one such child if it weren’t for this project. After only three months of attending a regular school, his father told him he couldn’t manage to pay the fees anymore. Muzammil was forced to leave school and trade his pencils for a knife, as his father got him a job cutting onions with a neighbourhood cook. It seemed, says Muzammil, that he would never again have the chance to go to school or ever study again. But then he heard of the home school programme and nervously approached his father. To his relief, once his father learned that no fees were needed, he happily allowed Muzammil to join the school. Though he still works after school, Muzammil knows he won’t be a kitchen helper for the rest of his life. “As long as my father doesn’t have to pay any fees and I keep working after school time, I can keep coming to school. This way my father is happy, and so am I,” he adds with a giggle. The lack of fees is only one incentive, however. Another is that HOPE schools are quite literally at your doorstep. “Formal schools are generally far off and there’s only one government school per area, which means that all the children cannot be accommodated,” says Agboatwalla. She adds that the problem is exacerbated when it comes to female students whose parents don’t allow them to commute longer distances. Given that constructing enough formal schools in everygoth, mohalla and village is impossible, the ability to have many home schools scattered around the same locality make it a cost effective model with a wider reach. This wider dispersal of schools also means that links with local communities are strengthened; something that in Saira’s case was of great importance. For her father, who works as a fruit vendor, it wasn’t enough that there were no fees to pay. He also wanted Saira to work as a domestic servant and contribute to the family income. Thirteen-year-old Anees Mustafa is one of the brightest children in Farzana’s class and is working hard towards his dream of becoming a cricketer just like his hero Shahid Afridi, so that he too can make his nation proud. Unlike many of the other children, Anees is lucky to have parents who support his quest to study. “My father is very happy to see me study, and he doesn’t have to worry about paying my fees every month. He says that if I study I will become a better person and make something out of my life,” he adds with visible pride. Along with the children, the home schools are also changing the lives of the teachers for the better. “When we go to these localities we always find that there are many women who are educated and want to work but, because of cultural restraints, they are unable to do so. An opportunity to teach from their own house is a perfect way to earn and make the most of their talent,” says Agboatwalla. That’s exactly what the case was with Farzana, a mother of four who had done her FSC and Primary Teacher Course. She had always wanted to teach but having gotten married immediately after completing her course, she found that her husband didn’t allow her to leave the house to work. So when HOPE approached them she was more than happy to accept. Now every morning she opens her doors to the 35 children who come to her home school. “I believe if I am able to successfully educate even one child, I have achieved something in my life, made use of my talent and become a link in a chain that will keep on bringing positive change,” she says. Eighteen-year-old Zarina Muhammad Ali was another young woman looking for an opportunity to give something back to her society and make the most of her education. Just like Farzana, all her requests to be allowed to teach at a local school were denied, even though her family could barely make ends meet. “Now I can do what I always wanted to right from home. There is just one earning member in my family and ten mouths to feed, making it difficult to survive. At least now I can take care of my own needs with my salary,” she says. With success stories like these, the feedback that this programme is getting is overwhelming. Parents are happy that their children are getting a free education at the homes of women who they know and trust, and educated women whose potential would otherwise have been wasted can earn an honest wage. The model is also a great example of community empowerment, where local people work together for the greater good of all. “It’s heartwarming to see people realising the importance of education and learning to put in their share to change the face and fate of their community,” says Agboatwalla. Published in The Express Tribune, Sunday Magazine, August 26th, 2012. Spreading hope in Badin District. Despondent surroundings, Miserable faces, threadbare clothes and shabby furniture such are the situation of underprivileged residents of Badin. But on the horizon which has never looked darker, there lies some ray of HOPE. The major causes of poverty in those areas are over-population, joblessness, uneven distribution of wealth, slow industrial growth, rise in the cost of living, etc. Poverty has lead to many social and economic problems. The depressed feelings of the kids were heart-breaking. Those kids who should be enjoying care-free innocent lives are deprived of their comfort and compelled to look after their younger brothers and sisters. They seem precocious and already mature at such a young age. They have understood the harsh realities of lives in such a brutal fashion. But volunteers of HOPE stand by their vow to aid their brethren in the hour of need. 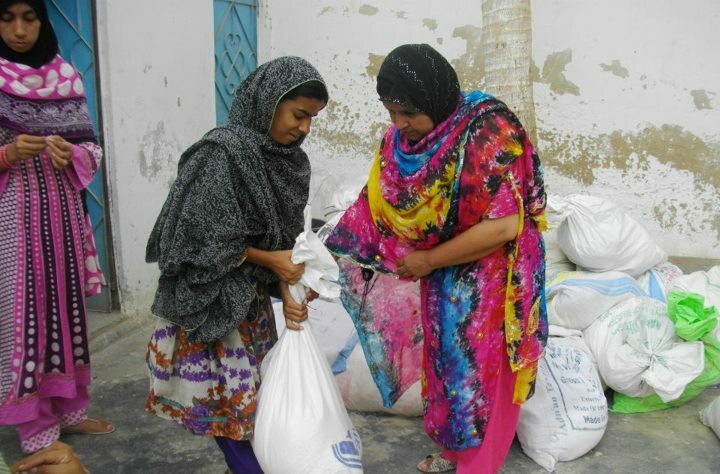 After the devastations of flood in Pakistan, HOPE built several shelter homes in Badin in order to improve the living conditions of the residents. The folks living in the area are in a pitiable state with improvements in their lives after HOPE installed a water pump in the area which ensured the supply of clean water to the populace of the area and helps in preventing the various diseases which widely spreads in the area due to unclean water. HOPE vigilance team visit Badin every month to monitor the projects and work in Badin. The team interact with the locals and discuss the issues they are facing. Attempts of HOPE to support these needy citizens should be lauded. There is no doubt that life is harsh for them. But there is still a bright beam of optimism left, which is the philanthropic spirit of Pakistani people that they stood by their brothers during flood and help the effectees continue to improve their post flood lives. These people have the right to enjoy the revelries of life and HOPE is tirelessly working to achieve that objective. Millions across Pakistan are suffering and deprived of the basic necessities of life. But yet there is a silver lining on the darkening sky in the form of NGO’s like HOPE. There are numerous folks living in Bilal Colony, Abdullah Shah Ghazi Goth, Bhittaiabad and Sachal Goth where people struggle against the troubles of life. HOPE has been assisting the populace of these poverty stricken areas to resist the errands of their lives for several years now, this time in the form of Ration distribution. HOPE Volunteers distributed rations after eid to ensure that those needy folks enjoy the support of HOPE as always. The distribution comprised of the bare necessities of ghee, atta, sugar and a blanket considering the requirement. HOPE has proved time to time that it stands along their brethren in hour of need. Eid is a festival of joy and bliss, a gift to muslins after the blessed month of ramdan. But as we celebrate the revelries of eid, it is our duty to remember those underprivileged kids, unable to enjoy the blessings of eid due to financial restraints. HOPE with its promise to stand by with Pakistani citizens in any sort of need has once again depicted solidarity with the deprived children of our nation. 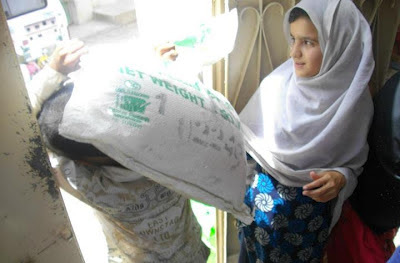 HOPE, after organizing iftaar dinners at its formal schools and home schools, demonstrated the philanthropic spirit by distributing eid gifts among their student at formal schools of thatta, Sachal Goth and Kashmir etc. The distribution consisted of gift packages containing new clothes, shoes and bangles. This scheme of HOPE was widely acknowledged and applauded by hundreds of students studying at its formal school. 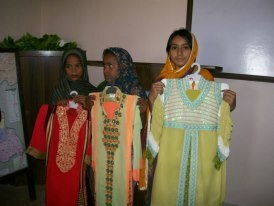 Volunteers of HOPE visited those formal and Home schools to deliver the eid gifts. Their euphoric expressions at viewing those gifts and their feelings at being included in the festivities of Eid were extremely satisfying. To distribute eid gifts to needy kids at formal schools is a gentle demonstration of the feelings what HOPE volunteers sense within them for our nation. Some people have much more than they need to live while others barely have enough to survive. Very frequently, the “privileged” possess no special virtues, or superpowers only a mere few possessions;. And ironically, the “Non-privileged” are desperate through no fault of their own —But what are the ways, if any of the “Privileged” want to help the “Non-Privileged” in these cases. The answer is simple; EID. Eid, coming after a whole month of fasting should incept a sense of forgiveness and light heartedness in one’s mind. The true meaning of Eid suggests, forming a sense of equality among the poor and the rich. There was once a time when the holy day of eid was a token of advancement for the poor but now, the true meaning of Eid, seems long forgotten. It’s not rare to see the sight of Muslims seizing this holy moment with a sense of swagger; Flashy clothes, houses filled with royal treats and pockets filled with hefty Eidi. They have it all, but the true essence of Eid. I for one have been spending all my eids in the exact same counterfactual manner. But now, I thank my fate that I’ve learnt the true meaning of Eid with HOPE. Yes, Health oriented Preventive Education (HOPE) lives by the virtues left by our ancestors, with its promise to stand by the needy; HOPE continues to excel in the field of community service. It has been said that, there is nothing pure in the world than a children’s smile. But, sadly – the poor and the non privileged children have forgotten to smile. HOPE has put all its efforts into reviving the art. Eid gifts have been distributed throughout the Formal, and the Informal Schools around Pakistan. 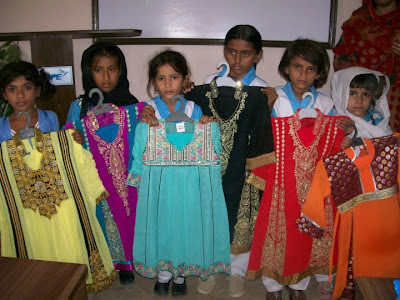 Specifically, the children of Kashmir and Thatta Schools were blessed with the distribution of these Eid gifts. The Eid Gifts, contained various objects ranging from, Clothes to Shoes to stationeries, All very desperately needed. The best of it was, the complacency which the children and the volunteers took out of the whole activity. At the end of the day, after coming to know about the services provided by HOPE, one questions his actions and believes in a better tomorrow. The astounding spirit of altruism has always been enigmatic, and it continues to bedazzle me; Human nature, at its utmost simplicity being selfish and vague, descends to self-effacement at a simple lonely cry out for help. HOPE, the biggest health NGO in Karachi, has been a token of the above statement since its inception. Its supporters have always stood together with the affectees of natural calamities in Pakistan in their most trying times and have tried their best to reduce the intensity of the victims’ misery with their kindness and openhandedness. Their enthusiasm reaches to its peak especially in the month of Ramazan. The true sense of Ramazan; forming equality with the less-privileged, seems to be long forgotten when you take a look at the general scenarios. But, HOPE tries to revive it through its efforts. Thursday evening, saw glimpses of just that as the night glowed of children with shiny faces, sparkling smiles and with eyes filled with dreams of a better tomorrow, all coming together in one Grand Iftaar Organized by HOPE. The not-so-privileged have always been a true sight for thankfulness. Around 900 children from the unwanted lifestyle paved their way to the Iftaar. These 900 were none other than the beneficiaries of HOPE home and Formal schools. The ultimate reason for the Iftaar was, to make the children feel wanted and loved, and to incept a sense of prosperity in their minds. Maghreb striked and the faces filled with infelicity, turned immediately to faces filled with ecstasy. To, see such a huge population, all being thankful for the moment, which you were responsible for, instills a sense of complacency in the mind. 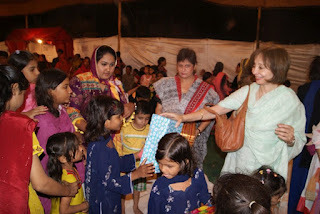 Iftaar was gradually rapped up, but the evening was far from over, as Dr.Agboatwala herself indulged in acts of benevolence by distributing eid gifts among the children. I don’t know what was more special, the ecstasy of the children, or the complacency of Dr.Agboatwala and staff. Children, after getting those eid gifts feeling so proud, started to flaunt them instantly. Eid, was right there, for those children. Having distributed everything, the children could not have wanted anything else, than a well-cooked dinner. Yes, dinner proved to be the epitome of the whole evening, as the children feasted themselves with the Pakistani trademark, Biryani. One could clearly see the fulfillment in their eyes. Even not wanting to, the evening had to come to an end and eventually it did. But what it left was the sense of complacency for the HOPE workers, and a dream for a better tomorrow for the less-privileged children. Working for the betterment of society has always been my passion and joining HOPE is the first step towards turning my passion into a career. HOPE has kept us engaged with its field activities since the first day so that I along with my other newly joined colleagues can develop better understanding of the organization we are working with. And it’s been a great journey so far. We not only visited the schools and hospitals in Karachi but also the ones located outside the city. Yesterday, an iftar party organized by HOPE was held on the rooftop of HOPE school, Thatta. Around 300 students along with the school and hospital staff had iftar with us. It felt great how our little deed had put up smiles on the faces of the children. 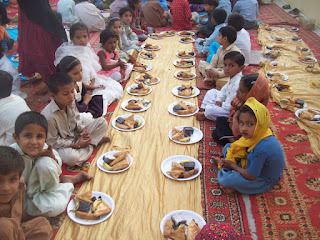 Some children were so eager to attend the iftar party that they came hours before the iftar. Thatta, with its destiny quivered and with its faith solaced has had its fair share of bad draughts. But, there’s always a silver lining in a dark cloud, In Thatta’s case, that silver lining is the philanthropic spirit of the Pakistani nation. On the 6th of August, 2012, I witnessed the epitome of this philanthropy in the face of an NGO. The zenith of sympathy, the pinnacle of nobility and the apogee of benevolence were put on show by HOPE ; Health Oriented Preventive Education. HOPE has been a token of selflessness since its inception. A school along with a hospital, being one of their kinds has been set up in Thatta. Thatta always, being under-privileged and idyllic in nature is now on the route to advancement because of the noble work done by HOPE. 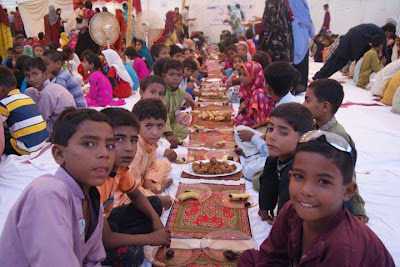 The evening was filled with ecstasy, as the rumor of an Iftar party spread through Thatta. An approximate of 250 people were present, which included a hefty number of children and women. These people were none other than the beneficiaries of the magnanimity of HOPE. At the stroke of the Maghreb Azaan, as the children,who are enrolled in Thatta Formal School, started their iftar in an enchanted manner, the joy on the faces of the HOPE helpers was priceless. Never had I ever thought, I for one would be so dazzled by a very clichéd act. What, for us is a routine iftar, turned out to be a festival for them. The delight on their faces proved that there still resides a sense of pretension in me. Eventually, it had to end and eventually it did. But what came out of it, their happiness, was priceless. What were before iftar, scrawny faces with eyes sucked deep into their sockets, were now faces filled with ecstasy and complacency. And all of this has to be credited to HOPE. It was that moment, I was sure that no matter how life treats you, no matter how many times people let you down, there will always be someone like HOPE to help you back up. Thatta, the land of historic Makli Hills, where the great Shah Jahan Mosque is present, the capital of three successive dynasties depicts the resplendent culture and traditions of Pakistan. But now this historical city presents the story of grandeur long gone, memorable architecture near extinction and citizens left in a beleaguered state. Yet all hope is not lost even though the city’s governance is poor. I work for an NGO for providing poor people with an educated and a healthy future. 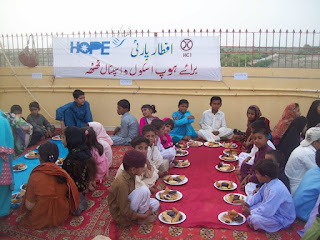 Monday eve saw an illustration of such compassionate acts when HOPE arranged an Iftaar Party at its formal school in order to provide food and iftar for the needy in the city in this blessed month of Ramadan. 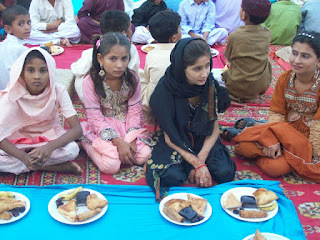 Approximately 250 children men and women alike gather for the iftaar dinner. Despite the financial restrictions the school was beautifully constructed. The folk which turned out at the party were brightly dressed and had an air of nervous excitement flowing through them. During Iftar the conduct of students was admirable, Children of all ages were present and the seniors took a lead in ensuring that their younger fellow mates comfortably dine during iftaar. The innocent smiles on the faces of the children was extremely gratifying and affirmed my belief that all the efforts, the hassle, the obstacles are worth going through just to see a smile on the faces of those underprivileged children. Field trip is an exclusive way to offer a learning experience for every individual. For me, it was an empirical learning opportunity to visit HOPE schools and hospitals together with the team as it provided a great chance to communicate with the teachers and doctors working in those schools and hospitals. 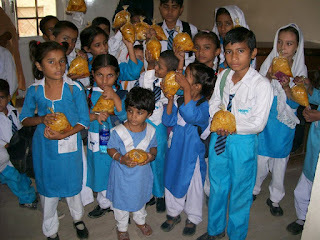 We visited quite a few home schools, formal school and a hospital in Korangi. It reinforced my philosophy and understanding of the field, social work and the mission that HOPE is working on. The field experience offered me to get personally involved in the activities carried out by HOPE. I gained additional insight into programs and projects conducted by HOPE. It also increased my professional self-awareness and built my understanding to help enhance job competence. I've always had interest in the social work and through these trips, HOPE intensified my passion to serve the humanity by giving me a chance to witness the crises that the underprivileged people are going through and how HOPE is helping them is fascinating. The ecstasy of a soul cannot be portrayed in a few words, but an actual experience is a prerequisite to do so. Visiting the informal schools constructed by HOPE (Health Oriented Preventive Education) has incepted a sense of sympathy in me. Never had I thought, I would feel so empathetic towards fellow human beings. The living standards are close to being none, in the under developed areas of Karachi, Sachal Goth and Ghaggar. HOPE home schools, many children in their teenage are enrolled in these schools who are otherwise deprived of the basic right to education. To see such an enthusiastic thirst towards education has revitalized my faith in the idea of prosperity for the country.